I was contemplating many recipes that I wanted to be my first and while it could have been something more elaborate and photogenic, I picked something that is very VERY close to my heart. As I build my backbone to my blog, I want to keep adding things that hold value to me. One of them being: hummus. Now, I am not from a background where hummus is common, but ever since I tried TRUE hummus for the first time in a little restaurant owed by 2 brothers that grew up in a place where hummus thrived along with other delicious Mediterranean foods like freshly made, herb studded pita bread, creamy lentil soup, and the most silky and flavorful hummus I have ever tasted. It was life changing. After that, I was determined to make my own hummus taste just the same or REALLY close. I started by following different kinds of recipes that I had found on the internet and while they tasted good, they were not giving me that similar taste I was wanting, but I could not figure out what it was. I tried countless recipes until just recently, after trying it over and over, I have finally come up with a recipe that I think tastes similar to the one I fell in love with. I am so proud of myself for finally achieving the hummus journey. 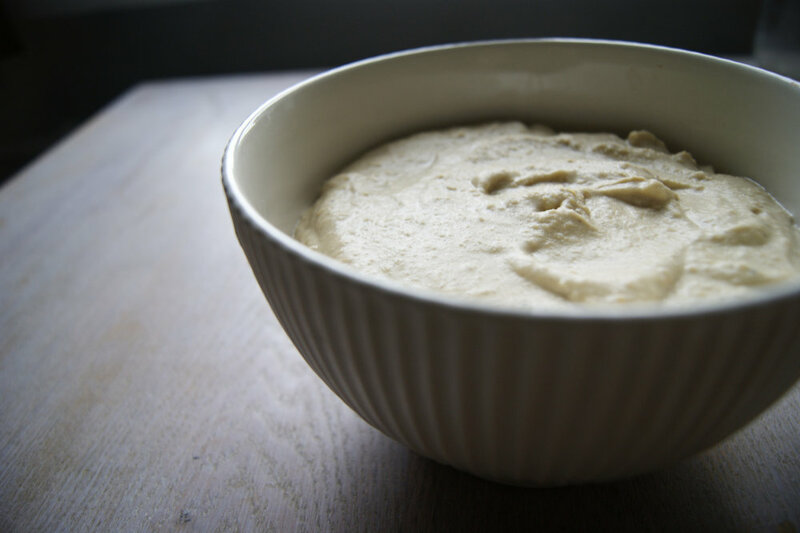 It might sound silly, but it was a very tedious and annoying task when all I wanted was simply a hummus recipe that reminded me of the one that started me on this journey. I think the drive also came when I moved to Estonia because, sadly, where I live specifically, good hummus is very difficult to come by and I really wanted to be able to recreate it at home. Now, I did some personal research on the history behind hummus and its origins can’t be pinpointed to a specific country other than it originated in the Eastern Mediterranean area of the Middle East. However, today, hummus is central to Israel, Lebanon, Turkey, Egypt, and other countries in that area. The actual word “hummus” means “chickpea” in Arabic and as to how true traditional hummus is made, that to, is difficult to pinpoint since so many countries claim to have the best/most authentic recipe however, the origins got lost in records due to lack of proper communication throughout the centuries. Since all the same ingredients were used throughout the Middle East in various countries, the recipe could have be made and then reinvented over and over again causing a blur in the true origins. Now, that goes to say that my personal recipe for hummus may not suit your taste profile, this is what I enjoy and have spent countless times testing until I found what made my taste buds go wild. It makes me feel like I’m sitting right there in that restaurant, with a huge pile of silky hummus, warm pita, and the smell of curried lentils. So, if you are a fellow hummus lover, give this recipe a try and if not, try it anyway and you might be surprised. My measurements are very rough because I don’t like to be too precise; I simply know that ratio that makes this taste wonderful. The key is heavy on garlic, cumin, and tahini and little acidity. Using a blender or food processor add garlic, tahini, olive oil, cumin, salt and pepper. Blend until creamy. Add chickpeas and blend. Stop to scrape down the sides and keep blending. You can add water here to thin it out. It may be tedious to keep blending, but I promise you it is worth it. That is the only way to achieve the really good texture. Once it is finished, transfer to bowl and chill for at least 15 minutes or if you can’t wait, like me usually, eat immediately. I love pairing as a snack with raw veggies, as a meal with roasted veggies, chicken, and quinoa, or making it very thin and using as salad dressing. Or, if you have good pita bread on hand, please devour. That is probably one of the first things I am doing when I fly home. I am coming for you, hummus.